ST. LOUIS, MO--(Marketwired - Nov 7, 2013) - In today's job market, things can change as quickly as the weather, so when it comes to finding employees who are dedicated and willing to stick it out through both good and tough times, businesses know that those people are worth holding on to. Last month, the Renaissance St. Louis Airport Hotel celebrated eight of its associates, all of whom have given at least 25 years of service to the St. Louis business hotel. Michael Sanders, general manager of this hotel near University City, MO, hosted a reception this past October to honor these hard-working Renaissance associates. Included in the 25 years of service group are Larry Franks, bell captain; Keith Hearndon, lead steward; Larry Johnson, banquet captain; Anita Mix, laundry attendant and Judy Trask, banquet captain (Mix and Trask both started work the same day in 1988). The reception also recognized three associates who have dedicated an astounding 30 years of excellence and applied for their positions while the hotel was still under construction. They include Barbara Perkins, banquet server; Terrence Tolley, line cook and Gerard Grotegeers, a.k.a. "The Muffin Man," line cook. "We are proud to honor these individuals and sincerely thank them for their many years of service to the hotel and guests," Sanders says. Renaissance associates like those honored at the reception are part of what makes this St. Louis airport luxury hotel a favorite with visitors. In addition to first-class service, guests are treated to a boutique hotel experience that's as comfortable as it is stylish, and is conveniently located adjacent to the airport and minutes from downtown businesses, attractions and entertainment. A flexible lobby offers a space for relaxing with a book in the library, meeting with clients in semi-private seating areas, checking email with free Wi-Fi or grabbing a bite to eat at Norah's Crafted Foods & Spirits. No matter where guests go, from their spacious room to the modern fitness center, the hard work and dedication of the hotel associates can be seen in even the smallest details. At the Renaissance St. Louis Airport Hotel, guests enjoy both the convenience of staying adjacent to the STL Airport and the comfort and attentive service of a stylish boutique hotel. 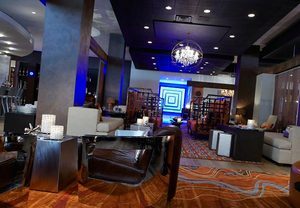 Located just minutes from downtown businesses, attractions and entertainment, this St. Louis hotel welcomes guests with a contemporary lobby, where textures and themes inspired by the region's industrial roots create a welcoming space for meeting, dining, relaxing and working. Accommodations at this AAA Four Diamond hotel feature plenty of space, warm honey tones, pillow-top mattress, spacious work and seating areas, flat-screen HD TVs and high-speed Internet. Executive Suites offer additional amenities, more space and a wet bar. Business-friendly amenities include a complimentary airport shuttle, fitness center and more than 37,000 square feet of meeting space. Meet over a great meal at Norah's Crafted Foods & Spirits, featuring local, seasonal recipes that take a global approach to contemporary American cuisine. St. Louis hotel specials and a pool make this an affordable and smart choice for a family vacation. Nearby kid-friendly attractions include the Gateway Arch, St. Louis Zoo, Science Center, Magic House, Forest Park, Grants Farm and World Aquarium; adults can head to Ameristar Casino or the Anheuser Busch Brewery.